Canterbury is an increasingly important fine wine region located on South Island’s eastern seaboard, albeit accounting for only four percent of total plantings in New Zealand – yet nine percent of wineries. Pinot Noir, Riesling, Chardonnay and, increasingly, Pinot Gris are the varieties to watch, the Mountford Estate producing one of New Zealand's leading Pinot Noirs from its base in the Waipara Valley. Canterbury is an increasingly important fine wine region located on South Island’s eastern seaboard, just north of Christchurch, albeit accounting for only four percent of total plantings in New Zealand, yet nine percent of wineries, suggesting a thriving single-estate industry (given the 90 percent increase in wineries there since 2000). In the rain shadow of the Southern Alps, the region is relatively dry and sunny with long, parched autumns, if constantly at risk from the south-easterly Antarctic blasts, particularly during flowering. Yields are further moderated by fairly unfertile, stony and on-the-slopes limestone soils. Pinot Noir, Riesling, Chardonnay and, increasingly Pinot Gris, Pinot Gris are the varieties to watch. 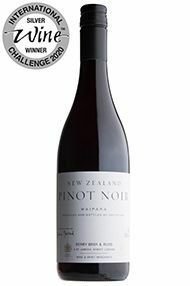 The Mountford Estate, founded in the early 1990s, is producing one of New Zealand's leading Pinot Noirs from its base in the warmer Waipara Valley. The Waipara style stands for warm flavours evocative of sweet red peppers and spices. Further south, on the border with Central Otago, lies the brand new region of Waitaki Valley, populated by only a handful of wineries since the late 1990s, but potentially a very exciting source of top Pinot Noir and Pinot Gris, due to its steep, north-facing limestone escarpment – if, at times, a cripplingly cool climate. Ostler Vineyards is a producer to watch, making an almost Beaune-like style of Pinot Noir.